Oh, I looooooooove it when you don't have to pre-cook the ingredients going into the slow cooker before throwing them into the slow cooker! This recipe does just that. No browning, sautéing, or otherwise prepping of meat or vegetables...you just toss 'em into the Crockpot and you are on your merry way. Which is the way that I feel it should be for slow cookers. Oops, I did it again! Another completely unappetizing picture of a total delicious meal. This was another winner from the Best of Bridge cookbook series. The flavours of chicken, beans, and corn in a rich and creamy salsa and cream cheese sauce were oh so good overtop of white rice and served with a side salad. My rice of choice is always jasmine (even though it's more frequently used in Asian cooking) because it has such great flavour. 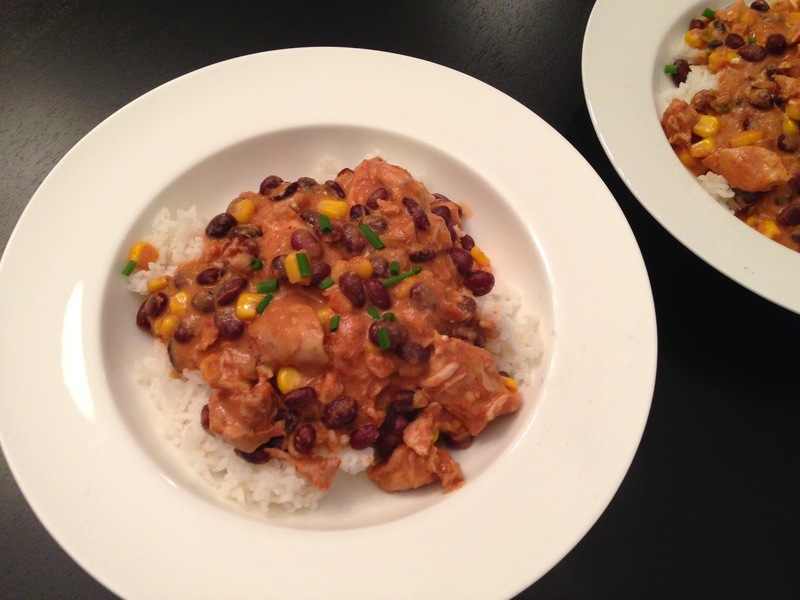 This meal served The Hubby and me as the perfect weeknight dish on a cold rainy winter night. This recipe is a definite keeper, and we will be making it again soon. In a slow cooker, add chicken, beans, corn, salsa, tomato paste, and salt, and give everything a good stir. Cook on low for 5 - 6 hours, or on high for 2 1/2 to 3 hours. In a small bowl, stir together the chili powder and vinegar until smooth. Add the mixture to the slow cooker, along with the cream cheese. Continue to cook on high for another 15 minutes until the cheese is melted, then stir again. Serve over rice and top with green onions. Enjoy! I love chicken and rice combination! Is it possible to use brown rice? Or maybe brown rice will not get soften enough? K to the S, did you make this recipe, are you satisfied?